We investigate human viewing behavior on physical realizations of 3D objects. Using an eye tracker with scene camera and fiducial markers we are able to gather fixations on the surface of the presented stimuli. This data is used to validate assumptions regarding visual saliency so far only experimentally analyzed using flat stimuli. We provide a way to compare fixation sequences from different subjects as well as a model for generating test sequences of fixations unrelated to the stimuli. This way we can show that human observers agree in their fixations for the same object under similar viewing conditions – as expected based on similar results for flat stimuli. 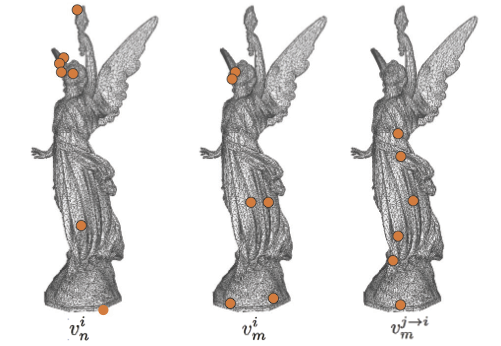 We also develop a simple procedure to validate computational models for visual saliency of 3D objects and use it to show that popular models of mesh salience based on the center surround patterns fail to predict fixations. Please see our project page for more details. This entry was posted in Uncategorized by Xi Wang. Bookmark the permalink.